Wood slices instantly awaken my ecological side and the nature lover in me. Wood slices are so easy to make and can represent the base for a wide range of ideas, each one more interesting than the next. Here, I have selected 4 activities/games that can be created using wood slices. They are all fun to explore with children since they make use of materials that differ from the traditional pencil and paper duo. To begin, you will need a tree (the size will vary per the scale of your projects) and a handy man, unless you are comfortable operating a saw. Cut the tree trunk into "slices" to create round wood slices. Each one will be unique. Read on to discover ways to use them. Using the drill, make a hole in each wood slice. Give each child one wood slice. Provide poster paint and let them tap into their creativity. Once the paint is dry, thread a piece of ribbon through the hole in each wood slice, tie a knot, and hang children's decorations. With the drill, make a hole in each wood slice. 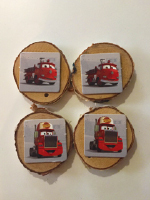 Glue each child's picture in the centre of his/her wood slice. 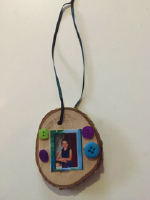 Children use the available accessories to decorate their wood slice as they wish. 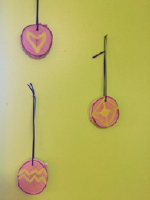 Thread a piece of ribbon through the hole in each child's wood slice, tie a knot, and hang the frames. These wooden frames make great gifts. Give each child a certain number of wood slices. On each one, write a short message for parents. Ask children what they would like to see written on their coasters for inspiration. Spray each coaster with aerosol varnish. Set them aside to dry. The coasters make great gifts for a special occasion. Glue one picture on each wood slice and arrange them upside down on a table. Children take turns turning two slices. The goal is to find identical pictures or illustrations. I hope you find these suggestions as cute as I do. Once again, these activities and games are simple. The best part is that they can be created without spending a penny.